Public Lecture: Representation as Research? 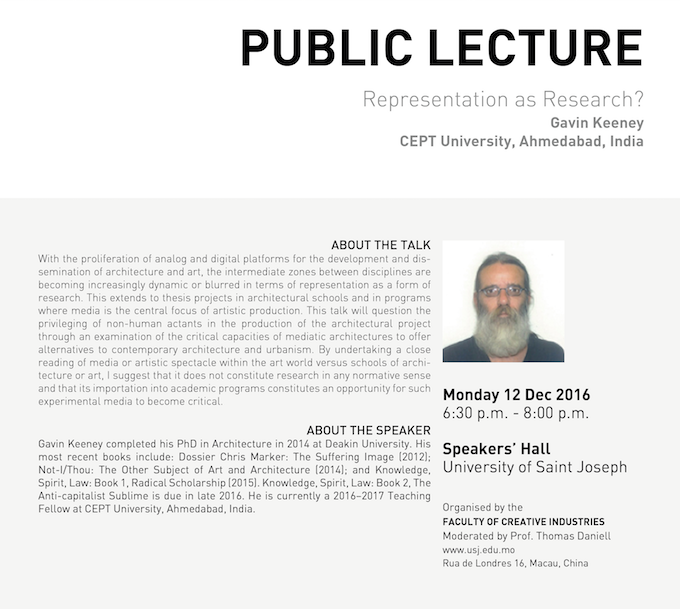 Public Lecture: Representation as Research? by Faculty of Creative Industries on 12th December 2016. With the proliferation of analog and digital platforms for the development and dissemination of architecture and art, the intermediate zones between disciplines are becoming increasingly dynamic or blurred in terms of representation as a form of research. This extends to thesis projects in architectural schools and in programs where media is the central focus of artistic production. This talk will question the privileging of non-human actants in the production of the architectural project through an examination of the critical capacities of mediatic architectures to offer alternatives to contemporary architecture and urbanism. By undertaking a close reading of media or artistic spectacle within the art world versus schools of architecture or art, I suggest that it does not constitute research in any normative sense and that its importation into academic programs constitutes an opportunity for such experimental media to become critical. Gavin Keeney completed his PhD in Architecture in 2014 at Deakin University. His most recent books include: Dossier Chris Marker: The Suffering Image (2012); Not-I/Thou: The Other Subject of Art and Architecture (2014); and Knowledge, Spirit, Law: Book 1, Radical Scholarship (2015). Knowledge, Spirit, Law: Book 2, The Anti-capitalist Sublime is due in late 2016. He is currently a 2016–2017 Teaching Fellow at CEPT University, Ahmedabad, India.